Urakam Ammathiruvadi temple, located at Urakam in Thrissur is considered to be one of the foremost of the 108 Durga temples in Kerala. The Valayadheeswari Temple, popularly known as Ammathiruvadi Temple of Urakam annually celebrates five major festivals. They are Thrikkarthika, Pooram, Navaratri Illam Nira and Vavarattu. 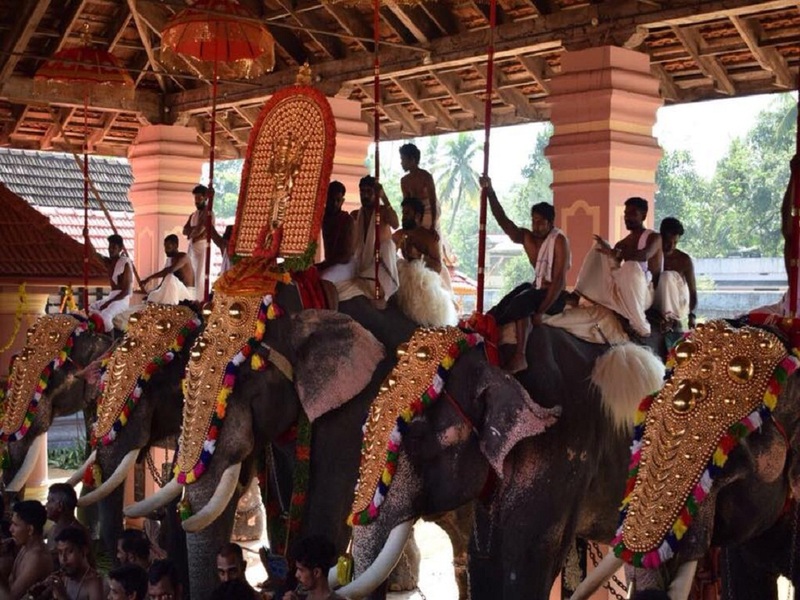 The Pooram is the other important event of Urakam Temple. This is a 13-day festival grandly celebrated with caparisoned elephants and traditional percussion ensemble. It is really interesting that the Goddess doesn’t have any Pooram day celebration at her temple. She will be one of the participating deities in Peruvanam and Arattupuzha Poorams. So many rituals are associated with the Pooram celebration of Urakam. On the 5th day the temple conducts Rohini Vilakku, which is followed by Makariyam Purappadu on the next day. Makariyam Purappadu is a ritual as the Urakathamma is going to participate in other pooram festivals. On the seventh day is the Thiruvathira Arattu held at Urakam Mambilli Temple pond, which is followed by Peruvanam Pooram and Punartham Arattu at Sree Balarama Temple and on the way back she will bid adieu (upacharam cholluka) to Chathukudam Sastha on the eighth day. On the 12th day early morning she will be participated in the Arattupuzha pooram and kooitiezhunnallipu (Devasangamam) with Arattupuzha Sastha and Arattu together with Triprayar Thevar in Mandaram Kadavu. Uthram Pattu will be held on the next day with Brahmini pattu. The Pooram festival ends with the Atham Kodikuthu ritual. The Thrikkarthika festival celebrated on Karthika asterism in the Malayalam month of Vrishchikam is considered as the birthday of Ammathiruvadi. 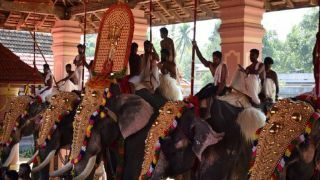 Special ezhunnallathu (procession) of caparisoned elephants and the grand feast given to the devotees are the major highlights of karthika festival.